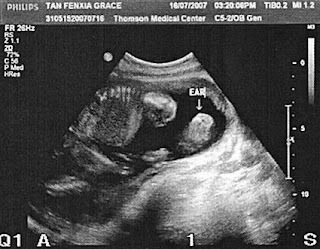 We went for detailed scan on monday...detailed scan is like an overall check of the baby's size, organs (to check the heart is beating ok, kidneys ok), facial features (like ears, lips ok..), feet and hands, spine growing ok, brain fluids, umbilical cord ok, and so on. So it's like a lil movie of baby. ..longer than normal. 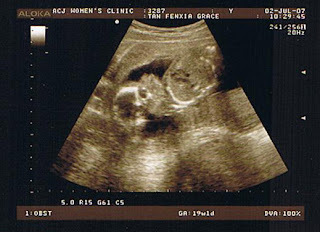 So we did see her mouth opening and closing, her heart beating really fast and blood moving in and out of her heart's 4 chambers (like some mini bio lesson i try to recall), her bladder (as pointed out by the Radiographist), even the fluids through the umbilical cord. 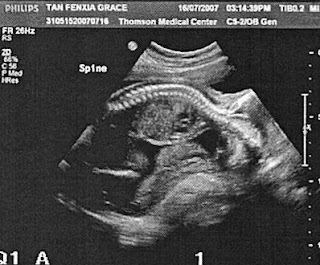 One of her arms was over on her head (which reminds me of how i sleep sometimes and this is not the first time we saw her with her arm at her head), and the other arm clasped. Most of the time we couldn't really identify much (other than the hands, feet and spine) if not for the radiographer who pointed it out. though i hope she would have turned around somehow...dunno how it is a comfortable position to snuggle..but i guess babies bob all around mummy's womb. this part is of her arm...one over her head..and the other is her hand clasped. On the sunday that has just passed, i discovered slight spotting (aka light bleeding like in the beginning or end of a period). No discomforts but still a cause for concern. I know it's plausible during the 1st trimester but not much heard during 2nd tri. Checked out the internet and found not much answers other than saying to contact doctor. It wasn't really serious so i dropped my gynae an email asking about it, which he replied (at 11pm!) to better drop by in the morning to check. Which we did...a lil too early and waited till like 1030am before my gynae could see me. anyway what's low lying placenta? Meaning the placenta is situated lower in the uterus, closer to the woman's cervix. A low-lying placenta at this stage of pregnancy is regarded as normal because the lower segment of the uterus has not fully formed yet. As many as 15% to 20% (one in five to six) of pregnancies have a low lying placenta. was given medication to relax the womb and multivitamins (fish oil and calcium) which all added up to $88.81. good thing consultation was part of the package we took up. (it's a $758 package). gosh..the money to spend! 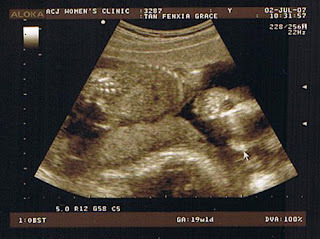 but got to see baby again..and sometimes i can't really make out the ultra sound images...other than the arms and legs. and this time as usual baby's been quite active rolling and moving about. 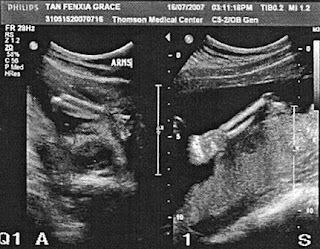 it's quite exciting feeling baby inside moving and kicking (usually in the mid day and night time), and feeling baby's heartbeat and sometimes i can feel baby on one side of belly and then after that move to the other. 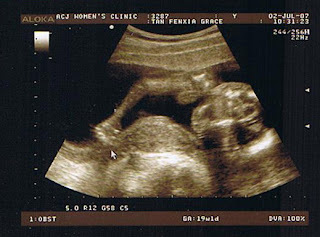 this time dr.tan said that baby could most likely a girl (a girl!! :) )but still can't confirm. 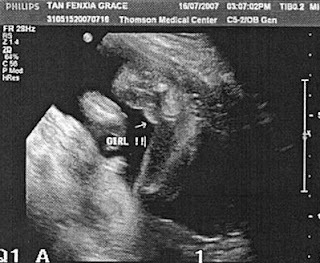 so we'll see how in 2 weeks time when we go for the detailed scan. really 2nd trimester is a wonderful time of the pregnancy where i feel a lot more energetic (but i still need my sunday naps), and enjoying the wonders of baby growing in me. though somethings are sinking in...like getting tired after too much walking, finding it difficult to fall asleep (oh dear it's starting...especially finding a good position).